Kofte is a delicious curried dumpling dish that is popular in North Indian cuisines. In Uttar Pradesh Kitchens, kofte are typically made with a variety of vegetables and paneer (Indian style cottage cheese). The curries can be tomato based or dairy based and vary widely in flavour. Summer squash is widely available here, yes even in the winter!! 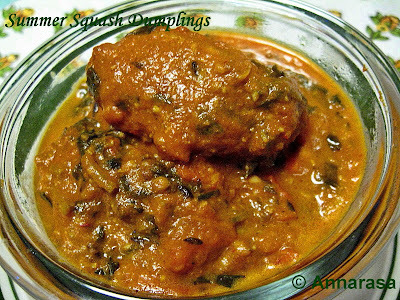 Its a very soft vegetable and is perfect for making kofte without adding any dairy products. 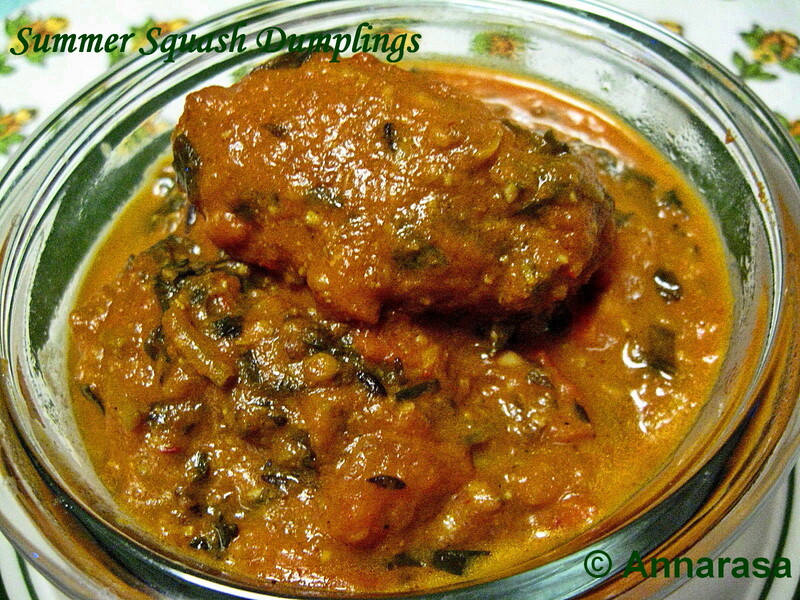 Dunked and cooked in this tangy tomato sauce, it makes for a perfect choice for any meal!! Pour enough oil into a kadai or deep fryer for deep frying. Heat. then turn down to medium. In a mixing bowl, sift together the chickpea flour, cumin, turmeric, and red chili powder. Add the grated summer squash and using a spoon, mix into the flour. There will be enough moisture in the summer squash to form a thick dough of this mix. Using the palms of your hands, make small balls, about the size of a lime. Deep fry in heated oil until the dumpling are cooked and browned. Remove from the oil and drain on a kitchen towel. For the sauce, heat oil in a saucepan. Add the cumin, turmeric, red chili powder, and coriander powder. Fry for a couple of minutes, then add the chopped tomatoes, fenugreek leaves, and minced garlic. Fry on a medium heat for 5 minutes. Add salt to taste, the kitchen king masala, and 2 cups of water. Bring to a boil, then simmer for until the sauce begins to thicken. Reduce the heat further, then put the koftas into the curry. Simmer on a low heat for about 5 minutes or until the sauces reaches a thickish consistency. Serve hot with rice, chappatis, or pooris. Kofta with squash is interesting..The gravy looks very creamy and inviting. Squash kofta sounds absolutely interesting, delicious curry.. Thanks for your wishes..Happy New year Apu! oh that is drool worthy recipe lady!